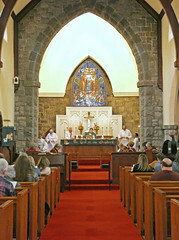 The Vestry’s focus for the August meeting was on Homecoming Saturday and Sunday, September 9 & 10. We are planning BBQs on both days with festive outdoor seating in the courtyard. We are making “Ask Me About” Buttons for ministry leaders to wear. This will also be Name Tag weekend. Parishioners are invited to bring baked goodies to share. We welcome everyone: parishioners, friends, family, and neighbors to join us for worship and celebration. Renovation of the Choir Room is just about done with new lighting and paint. Generous donations include a new file cabinet for music, an upright piano (from Roi and Judy Tucker), and an electric piano for the parish hall. Good Shepherd’s pilot program of Summer Lunch for Kids, coordinated with the Food Bank of SJ and staffed by a large group of parishioner volunteers, will end on August 30 as school is starting. Planning for the upcoming season includes Sunday School starting Sept 17, Confirmation Classes with Confirmation candidates and their parents meeting on September 24, and Crop Walk on Oct 15. 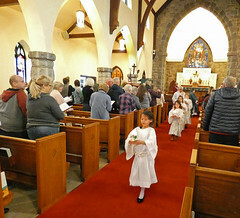 Deacon Carl announced that Camden Christmas will move this year to St. Paul’s Episcopal Church in Camden with St. Nicholas Sunday on December 3 and Epiphany (Three Kings) on January 7. Please stay in communication with your Vestry. Let us know what else we can do together to bring the peace of Jesus to the world both inside and outside our red doors! The Vestry: Sue Burkhard (Jr Warden), Len Clark, Jack Daugherty, Frank Jackson, Gail Morton, Elizabeth Nelson, Connie Parent, Deb Prieto (Sr Warden), Chelsea Richmond, Wayne Szalma, and Jim Wynkoop. We are supported and guided by: Chuck Lezenby (Clerk), Diane Wall (Asst Clerk), Lee Braidwood (Treasurer), George Funk (Asst Treasurer), Deacon Carl Dunn, and Mother Susan Osborne-Mott. The Vestry authorized funds to insulate the roof of the rectory front porch and the rear eave, replace parish hall lighting, and renovate the choir room. We awarded the annual HVAC maintenance contract to Friedrich as recommended by the Property Committee after reviewing various bids. We also passed the annual fire inspection by the borough. The Sunday School reported a year long high for attendance of 41 students! New tools that were introduced this spring as a supplement during Bible Story Time include a children’s lectionary newspaper and a hands-on wooden puzzle church seasons calendar. The Youth Group was congratulated on a very successful Harry Potter Night. Frank Jackson Jr, who graduated from high school, was awarded the Nancy Wasilnak scholarship this year. Mother Susan hosted a Vestry Retreat at the Rectory on Saturday, March 25th where she led a wonderful day of building trust and communication. During a brainstorming session we shared our dreams for Good Shepherd, big and small. 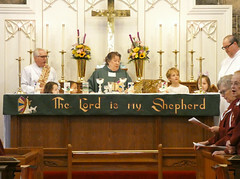 The Good Shepherd Vestry members are listed for you on the back of the weekly trifold and on our website. Roger Baker presented a special report at the April meeting regarding status of the Endowment Committee. George Funk, Diane Wall, Roger Baker and Harvey Corbett were appointed to continue serving along with other committee members. The Food Bank of SJ summer student meal program was evaluated and at the May and June meetings the Vestry voted to move forward with a pilot program at Good Shepherd this summer. Many of you are now volunteering to support this new ministry. The need to schedule rooms and audio-visual tools through Maryanne is discussed at every meeting! A calendar and reservation forms are in the Parish Hall. We happily completed the necessary contract and diocesan paperwork for our very own Deacon Carl Dunn. Please see the Special Report regarding the Spring Stewardship Campaign and the new Squirrels’ Nest Reserve which were a big project this spring. Please keep us and our work for Good Shepherd in your prayers!